Hi there, one of our crabs has recently molted but has not returned to his shell. He was walk8n* around looking at shells earlier, but is now just lying there not looking well. Please advise how we can best help him. Thank you! 3. Is a heat source used in the tank? If so, what? Yes, but not in use currently as Australian summer. House is air conditioned and we monitor the temp to make sure tank is in recommended range. 12. How often do you clean the tank and how? We’ve only had the tank for about 3 months and are planning to replace the sand and coconut fibre soon. Will give the tank a clean with water and a sponge. 16. Please describe the emergency situation in detail. The crab recently molted and this morning he was walking around without a shell and looking at other shells but didn’t go in them. I bought some extra shells today and when I put them in the enclosure he looks very lethargic not really moving and still without a shell. He had been hiding under his water bowl but i was worried about him so we put an extra plastic container over him to isolate him. Not sure what to do next other than leave him alone. PurpleBiff wrote: Hi there, one of our crabs has recently molted but has not returned to his shell. He was walk8n* around looking at shells earlier, but is now just lying there not looking well. Please advise how we can best help him. Thank you! crabs shouldn't leave their shells while molting. he needs to be reshelled immediately. Try and gently back him up into a shell. First rinse off any substrate with dechlorinated fresh water. I googled the Krabooz kit. It is not suitable for keeping hermit crabs. You will need to upgrade to a tank or tote. Please read through the information in the Care Sheets section, it really contains all the info you need to properly set up a crabitat. 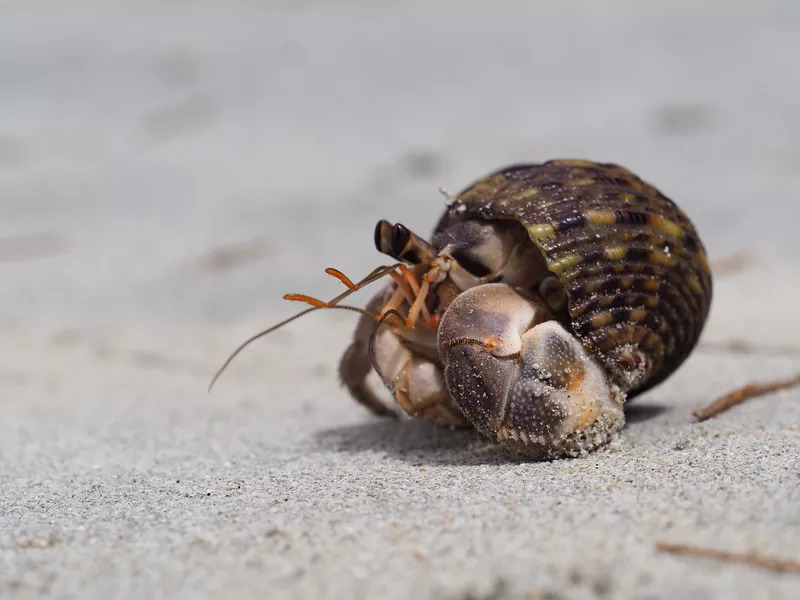 As stated already, your crab needs to be reshelled immediately, it wil not survie without a shell. Also, your humidity needs to be higher. Your substrate needs to be deeper, and needs to be wet enough to hold shape but not so wet that water is pooling. Many of us use a mixture of 5 parts play sand to 1 part Eco Earth. Pools need to be deep enough that a crab can submerge but also have a way out (rocks or ladder or craft mesh). The recommended brand of water conditioner is Prime, and the recommended brand of marine salt is Instant Ocean. Krabooz is probably not appropriate. Commercial food is not considered safe. Hi PurpleBiff, as the others have said, your crab will definitely need to be reshelled as soon as possible. And though I can’t offer much help other than that for your current situation, I do have some advice in regards to your crabitat. I am also from Australia and have been learning the best products here in our country for our crabs, which can be hard when all the information out there is in regards to American products. But I thought I might share some of the things I’ve found with you. When I first had my crabs I also used the Krabooz substrates, but have since learned that they are not suitable for crabs and very expensive. I would suggest buying cleaned playsand from Bunnings instead, as you can get 20kg for about $10. This is safe for crabs and much cheaper. If you’re looking for coco fibre or what is referred to as EcoEarth, I suggest buying the EcoTech coconut husk from My Pet Warehouse (they deliver if you don’t live near one). This helps keep humidity in. Substrate needs to be a minimum of either 16cm deep or 3x the height of your biggest crab, and it needs to be dampened with dechlorinated water until it is sandcastle consistency (so not dripping wet but enough it will hold when you mould it). The Krabooz kit doesn’t allow much for high substrate, so I recommend buying a fish tank instead. I recently got a 60L tank from PetBarn, which has been much better for my crabs than my old 10gallon tank. Out of curiosity, what lid does your tank have? As for the humidity it will need to be in the 80% to 90% range. Do you have a digital gauge? I recommend buying one as they are much more accurate than dial ones. Crabs have modified gills and so need humidity to breath, so it’s essential it’s at the right level. Also in terms of decorinator and salt water, you can buy Seachem Prime (which most recommend using) from My Pet Warehouse for dechlorination and order Instant Ocean Sea Crystals from EBay or Amazon. These are much better than the Krabooz treatments. There is also a safe foods list on the site so I would definitely recommend checking it out in the care sheets in regards to feeding. Also just wondering what do you mean by taking your crabs out for a walk? I hope this information has helped, and I wish you all the best for your crabs!